This page is to give advice on how to prepare any vehicle for CAP Operational missions. Virtually any vehicle CAN be used, but some are preferable to others. The emphasis of this page is on personally owned vehicles, not CAP corporate property. That being said, however, many of the things listed here can be applied to CAP vehicles as well. Every modification listed here is by no means required. The things that are listed here have simply been found to be very useful. Most of the modifications listed here are not permanent. You should be able to remove almost everything when you sell your car. Be cautious anytime you cut on your vehicle, for many reasons. While it may be almost too obvious, the best thing you can do for your car to be ready for a mission is to keep it in good repair. Change your oil every 3,000 miles and perform other periodic maintenance. Always keep at least 1/2 tank of gas in your vehicle. It can add over half an hour to your response time if you need to get gas. Keep as many things magnetic as possible, thus in compliance with the principle of non-permanence AND that of rapid conversion. Magnetic mount antennas are commonplace--get one for your 2m handheld and you'll significantly increase the usefulness of that radio. One thing that makes a nice addition to any vehicle that is also magnetic, but not magnetically mounted, is a compass. Find a nice and adjustable compass for permanent installation in your vehicle. Marine compasses generally do a good job. A JC Whitney automotive catalog has several options. Remember: it is much easier to find the target if you can first find mission base. I also highly recommend a strobe light for your vehicle. You must check with your state's laws to find out which color is legal, but in general, Amber or White is fine. There is one principal reason for using a strobe: being seen. The legality of operating a strobe, in most states, is the same as operating your hazard flashers. That is, YOU MUST BE STOPPED to operate your strobe. That being said, back to the purpose of the strobe--being seen. There's two groups of people that need to see your ground team vehicle. The first group of people is other motorists. This is a safety issue: if a car hits a member of your ground team, then your team is effectively out of the search. You'll do the survivor no good by hurting someone else. So when you pull over to take a DF reading, turn on your hazard lights and your strobe. The other people you want to see you is the aircrew. Air to ground coordination is what keeps CAP in the SAR business. To coordinate best with the aircraft, they need to know where both you and the target are. A winking strobe light helps the aircrew differentiate your vehicle from every other one out there. Furthermore, it allows the airplane to bullseye you at night. Note that CAP Regulations prohibit the use of Red or Blue lights regardless of state law. There is no provision for sirens, and I can't see the use for them by anyone on CAP business. Just to be clear, CAP Regulation 77-1, 15 May 1997, Paragraph 9 Subpart f. states: "Marking of rescue vehicles must conform to federal, state, and local laws. Use of light bars on vehicles must be approved in writing by the wing commander (region commander if a region vehicle) and must follow guidelines established by the resident state and all surrounding states. Approved light bars will not duplicate federal, state, or local emergency vehicle light bars, unless a written waiver is obtained from the state and locality. Do not use the colors red or blue on the light bars. Do not use sirens." So there you have it, chapter and verse. To be honest, however, CAPR 77-1 does only govern corporate vehicles. Personally owned vehicles should attempt to replicate that standard if they are to be used for CAP activities. Red and blue are illegal even to display in many states. Green is used for the ICS command post and not recommended for use in CAP. I recommend white or amber whenever possible. Other markings on your vehicle can help both motorists and coordinating aircraft. I personally recommend three markings. 1) Buy magnetic backing from your local sign shop and apply the 12" CAP EMBLEM (not the seal) to the backing. These emblems are reflective (aiding visibility) and clearly identify your vehicle. CAPR 900-2 outlines the use of the emblem versus the seal. The end result is quite attractive, as well. If you can wait a little longer and don't want to make your own, Don Winter of the Pensacola Composite Squadron reminded me that the Civil Air Patrol Supply Depot has thoughtfully made them for you. They'll probably be cheaper than making your own, too. The Part Number is CAP306FM and the cost is $9.95 each (plus shipping and handling, of course). You can access the CAP Supply depot via a link on the links page. Don reports that his has lasted for over two years and still looks great. Another marking that can be used is an arrow or wedge type design on the roof of the vehicle. While it seems inherently obvious to ground pounders which way the vehicle is pointing, it is not so obvious to observers in the air. If the arrow is made of reflective material, your strobe will partly illuminate it, even at night--helping orient the aircrew to your vehicle. Again, magnetic-backed material works very well for such a task. Red and white reflective tape is commonly available at Wal-Mart, K-Mart, and similar stores. It can be found in the automotive section. Use whichever color that will contrast more with your vehicle's paint color. Magnetically backed plastic of various colors is available commercially. You can cut and tailor it to meet your specific needs. Johnson Plastics is the supplier for magnetic plastic sheeting: call 800-869-7800. Six or eight colors are available. It also might not be a bad idea to post your tactical call sign number on the roof of your vehicle. Again, obtain a sheet of magnetic material and construct numbers on it. The key here is SIZE. I would recommend 12-inch numbers as a MINIMUM. These numbers can be obtained through companies such as "Aircraft Spruce & Specialty." The "back button" on this page is an overhead view of a van sporting the style of arrow and call sign numbers I prefer. Notice that the numbers read properly when you are aligned with the arrow--another hint for the aircrew. The equipment that you carry inside of your vehicle can vary as much as the team members it carries. It is not a bad idea to keep your search gear in your vehicle at all times. It makes a great winter survival kit and enables you to pack for a mission in absolute minimal time. If you carry a substantial first aid kit, it may be utilized for roadside emergencies as well. In fact, if you are playing the odds, you're much more likely to find someone who was in a car accident than in an airplane wreck! 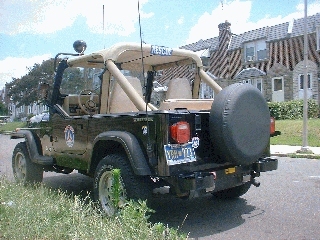 Shown below are images of personally owned vehicles outfitted in a manner described on this page. 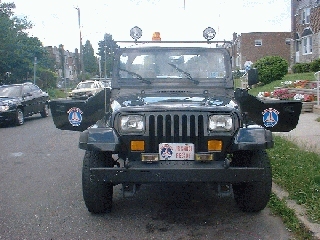 Both of these vehicles give an appearance of professionalism and lend credit to CAP. What's most impressive is that none of these markings are permanent--you don't need to drive to work and 1) give the appearance of impropriety using a government-looking vehicle for private use and 2) looking like a geek all the time. I would sincerely appreciate the submission of pictures for similar vehicles. Also available are pictures of my Ford Ranger truck on its own page. Note the recently added "mission clothes." I have chosen to permanently mount some of the items I listed above that can be magnetically mounted. I have magnetic items for it, but they are stored away in these pictures. A good place to store magnetic items is stuck to any piece of iron or steel. That way they won't lose their magnetic properties. I personally use the interior of a body panel as a surface for sticking my signs when they're not in use. A reader contributed a link to AmerSAR, which has several member-owned vehicle ideas. Louisiana Wing has an interesting Mobile Command Post, "The Beast."